Many mythical creatures have some sparkle. They say that vampires have glittery skin when they step into the sun. And fairies often have shimmery wings. But what makes a magical creature's level of sparkle stand up and say hello? We've done a lot of thinking on this and we've decided it comes down to the glitter chunk reflection ratio (GCRR to the experts). The GCRR is all about the size of the glint. According to our research fairy dust doesn't glitter, instead, it glimmers. This is due to the tiny nature of the sparkle on the fairy's wings. In comparison, this particular unicorn's dripping jewel set has an extreme GCRR factor, giving it a high sparkle value (SV to the experts). So if the description "glimmer" or "glitter simply isn't good enough for a mystical creature such as yourself, pick a costume with high GCRR like this beauty! Flaunt your sparkle factor by topping off any mane with this unicorn set. 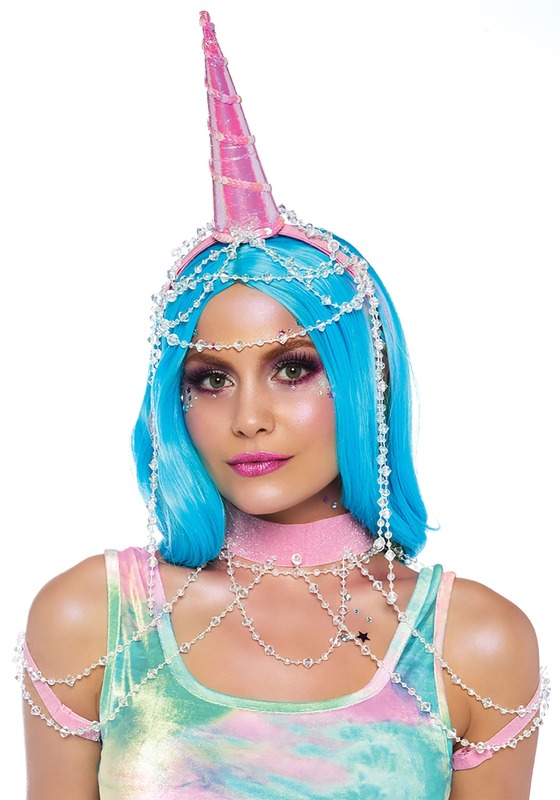 The headpiece features an iridescent pink unicorn horn that has sequins winding all the way to the tip. The sparkly, clear gems fall from the base of the horn, loop across the forehead, and fall down each side to frame your face. The soft pink collar will make and ensemble a show-stopper. With draping gems falling down the neck and shoulders, adding an elegant touch to any look. Are you ready to transform? Pair this set with a bustier top over a strapless dress and you'll be ready to flaunt your new mystical personality. Now all you gotta do is find a double rainbow to take an epic selfie with!